(On the phone) Boil them until their flesh falls off....You heard me!!!!! Thunder: I can halp you! Thunder: Master, you are flesh! Thunder: Play your cards right... you live to talk about it! Eddie: Well sure it was a war. And anybody that showed up was gonna join Lem Lee in the Hell Of Being Cut To Pieces. Jack Burton: Hell of being what? Eddie: Chinese have a lot of Hells. Wang Chi: Jack, listen, I need more of your help. I can't pay you today, OK? Wang Chi: How can I? I need all my cash for Miao Yin. Eddie: And it's gonna cost. She's got green eyes. Gracie: Oh no, seriously? Oh, that's an extra to these people. It's like leather bucket seats, it's double the price. Egg Shen: Can see things no one else can see. Do things no one else can do. Egg Shen: As real as Lo Pan! Jack Burton: Hey, what more can a guy ask for? Egg Shen: Oh, a six-demon bag! Jack Burton: Terrific, a six-demon bag. Sensational. What's in it, Egg? Egg Shen: Wind, fire, all that kind of thing! Egg Shen: Lo Pan is down there. Egg Shen: Where is the universe? Gracie: [Jack starts up the Pork Chop Express] What was that? Jack Burton: 6.9 on the Richter scale! Jack Burton: I know, there's a problem with your face. Jack Burton: [In a whore house under a different name] Henry Swanson's my name, and excitement's my game. White Tiger: Cash or charge? Jack Burton: [Jack points to the wall] Hollow? 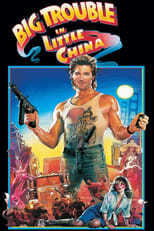 Jack Burton: [Pointing to Chinese writing on elevator] What does that say? Wang: Hell of Boiling Oil. Wang: Yeah, I am. It says, "Keep Out"
Jack Burton: Ahh, You know what ol' Jack Burton says at a time like this? Jack Burton: Jack Burton... ME! Jack Burton: Great. Walls are probably three feet thick, welded shut from the outside, and covered with brick by now! Wang Chi: Don't give up, Jack! Jack Burton: OK, I won't, Wang! Let's just CHEW our way out of here.